Paul Kellogg was a broadcaster at CFRB and CKEY in Toronto, WCBS News in New York and WELI in New Haven, CT. When he opened the Victory Cafe some years ago, the concept (in addition to providing comfort food for patrons) was to have a place for the arts and music com-munity to gather; so the second floor was used for things like: Jazz with Jeff Healey, the North by Northeast Music Festival, a Fringe Festival venue, weekly poetry readings, book launchings and music jam sessions. 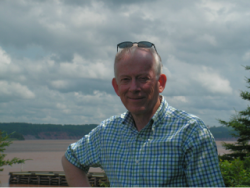 Paul is a volunteer and supporter of many local organizations such as Second Story Women's Centre, Lunenburg Folk Harbour Festival, Lunenburg Heritage Society, Musique Royale, Boxwood Festival, Lunenburg Waterfront Association and Paint Sea on Site.